Enough with the minks already!!!! In the last two weeks, we have lost three broody mamas and eighteen chicks to that evil, horrible mink. The last time he struck, he had the audacity to eat my remaining two mamas and their ten chicks on my birthday. Not how I wanted to start what I consider a national holiday. Just last night, the mink trotted down to Abigail’s farm and ate three chicks and five laying hens. Apparently it’s some kind of levitating super mink, because the day he killed Condi and her brood Gene reinforced everything. He just finished building an ingenious box trap, baited with raw chicken innards, and put it outside where we think it lives. Game on, mink. My biggest fear is that the mink will find a way inside the Bunny Ranch, where Cinnabun just had her kits. She had ten of them, but two of them didn’t make it from the start. She gave me no warning of the impending births at all, since I checked on her the night before she had them and she hadn’t started making a nest yet. Rabbits pull out their fur to make a comfy, cozy area for the kits, usually 24 hours before they arrive. Cinnabun, however, did it about three hours before. When I checked in her box, I could see the fur and figured I had about a day to prepare. Then I took a closer look, and discovered the nest was moving about enthusiastically. 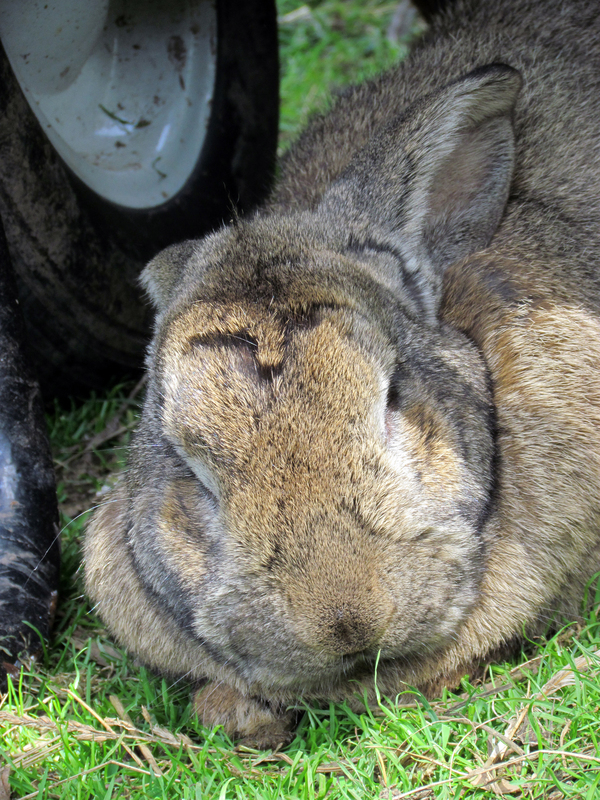 The wee buns are really cute – they’re in that stage where they look like miniature, hairless hippos. I would take a picture of them, but she gets pretty upset when I even think about reaching in there. Harvey, on the other hand, seems much more annoyed at being separated from his girlfriend. He spends most of his time guarding the Ranch, from his strategic spot underneath the wheelbarrow parked outside it. In other baby critter news, my chicken sitting on duck eggs experiment had a successful conclusion. 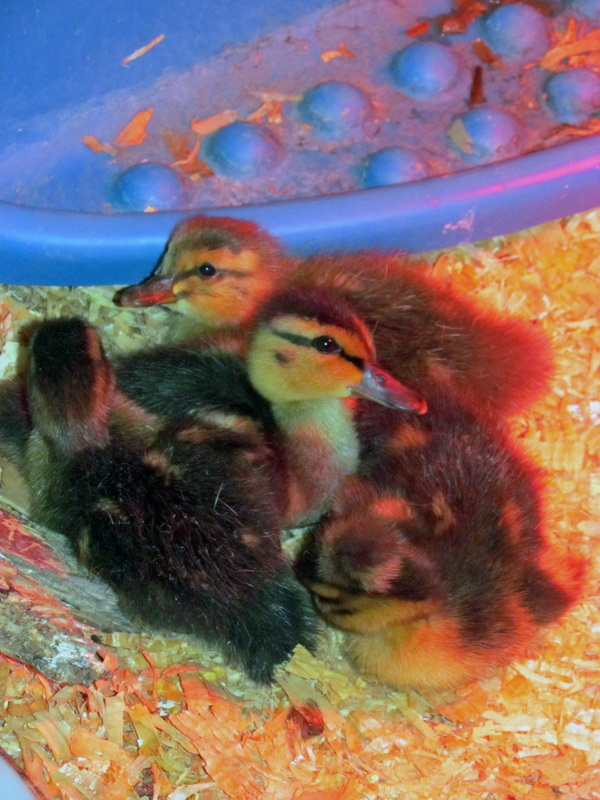 Four of the duck eggs hatched, although one poor duckling died a bit later. But three of them made it, and have happily adopted Lucky as a surrogate father. Lucky was pretty lonely for the three days he was by himself, but he perked up as soon as I put the three new ducklings in with him. They all cuddled up immediately in a big pile, and then after a few minutes he showed them where the pool was and they got their first swim. Oddly enough, the bunnies and the ducks made their appearance on the same day as the mink massacre, so things continue to balance out here on the farm. As much as I appreciate the inner workings of Mother Nature, I wouldn’t mind the odds being stacked in my favor for once.